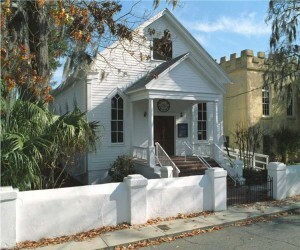 Jews have resided in Beaufort since as far back as the 1760s. In the latter half of the 19th century, as the town’s population grew, Jews from the vicinity gathered to worship in various locations: in homes, in apartments over stores, in the Masonic Hall, and then in a room on the second floor of the Beaufort Arsenal on Craven Street. The lot was purchased, money was raised, and a synagogue was built and dedicated on June 14, 1908. Beth Israel Congregation has been worshipping together in the same white clapboard building on Scotts Street ever since. At a time when many Jewish congregations in small towns across the South are disappearing, we remain a very viable group that fully intends to continue for at least another hundred years. We know that Jewish families have lived in the Beaufort area for much longer than one hundred years. There are suggestions that there were Jews living in this area before the 17th century. The first Jews to settle here were of Sephardic origin. Peter Lavien, a half-brother of Alexander Hamilton, was a Jewish merchant who lived in Beaufort before the American Revolution. Meyer Jacobs was an important Jew who lived in Beaufort. He was a Major in the Beaufort Artillery, and he helped welcome the Marquis de Lafayette to Beaufort in 1825. Jacobs was warden, or mayor, of the town in 1831 and represented St. Helena’s Parish in the state legislature in 1833. Before the War Between the States, the mother and sisters of Judah P. Benjamin lived in Beaufort. Benjamin was Attorney General, Secretary of War, and then Secretary of State in the Cabinet of Confederate States President Jefferson Davis. During the 1870’s, a different type of Jewish immigration began. Many Jews from Eastern Europe came to this area, bringing their ethnic customs as well as the Yiddish language. Retaining their religious identity, they soon became an integral part of Beaufort. Before this building was constructed, Beaufort Jews met at the Masonic Hall above a store on Bay Street. Some ceremonial functions were held in the large hall on the second floor of the Beaufort Arsenal. Congregation Beth Israel was chartered and incorporated in 1905. In 1908 this white wooden structure was built. Some members actually participated in the construction. Rabbi George Solomon of Savannah officiated at the dedication ceremony and installed the Torah Scrolls in the Ark. In 1910, members of the congregation purchased land for a cemetery and in 1920, a parsonage for the religious leader was obtained. The Social Hall was added in the 1950’s. Despite the fact that we have always been a relatively small Jewish community, we have consistently retained a religious leader. At present we have as our Religious Leader, Sy Commanday, a person with many years of experience as a religious school teacher and as a congregational leader. In earlier days, our members practiced Orthodox Judaism but now we follow the tenets of Conservative Judaism. We are still a very small congregation of about 75 families. Some of these families live out of town but continue to support the synagogue. We have services every Friday evening and one Saturday a month. There is a religious school held every Saturday morning and we schedule many social/religious events throughout the year. Our members continue to be active in the community. Jews of Beth Israel have served as Mayor of the city, Chairman of the school board, Member of city council and Representative of our district in the State Legislature. We work to maintain our religious traditions and Jewish identity, and to ensure at least another hundred years for this beloved Beaufort congregation, Beth Israel.